We know, it's a rough morning after a late night out. Luckily, as a public service to the hungover, every week we track down the best bartenders in America and ask them to share their favorite hair-of-the-dog remedies. This week, a wasabi and Sriracha-loaded Bloody Mary to help sweat that booze out of your system. ITS ORIGINS: Many bars and bartenders lay claim to the original Bloody Mary. (See Harry's New York Bar, the 21 Club and my great uncle Toby.) One such story comes out of the St. Regis Hotel in New York City, which professes to have perfected the ultimate hangover drink stateside in 1934. "Right after Prohibition was lifted, the St. Regis wanted to form one of the best bar teams in the entire United States," Paramore says. They hired French bartender Fernand Petiot, who had made a name for himself at Harry's New York Bar in Paris. "Fernand had already been working on this recipe in France, but he finalized it in New York," Paramore explains. As the story goes, a prestigious client staying at the St. Regis requested a spicy vodka drink with his breakfast. Petiot served him a tomato juice-vodka concoction spiked with Tabasco. He called it a "Bloody Mary" after the brutal Queen Mary I of England. "The St. Regis management didn't think that was an appropriate name to have on their menu, so they named it the Red Snapper," Paramore says. "They still call it that at the New York location, but Bloody Mary is the name that caught on." Today, every St. Regis location serves a signature Bloody Mary inspired by the region of the world where the hotel is based. 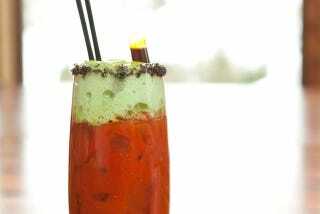 To wit, the St. Regis Deer Valley, situated 7,452 feet above sea level, serves the 7452 Bloody Mary. ITS HEALING POWERS: Bloody Marys are saluted as the supreme restorative cocktail and derided as the easiest brunch drink to screw up. What's so great about it, anyway? Is it the easy-to-swallow vodka? The hydrating tomato juice? The crunchy celery stalk? According to Paramore, it's the spicy peppers. "When you're hungover, you have all of that alcohol stuck in your body," he says. "A Bloody Mary is supposed to help flush you out." His version, the 7452, incorporates horseradish, Sriracha, cayenne pepper and wasabi. "It's not supposed to be an easy drink to swallow," he says. The 7452 may not be for the faint of heart, but every morning the bar is packed with skiers who went a little heavy on the après ski the night before. "They trudge in and ask for the Bloody Mary first thing," he says. "I offer them water, and they're like, 'No. I'm good. Just get me a Bloody Mary.'" After chugging it down, they perk right up. "I don't know if it's the actual Bloody Mary or if it's a placebo effect, but they definitely feel better. Sometimes I'll see them a couple of hours later, and as long as they haven't been drinking that whole time, they're on top of the world." SOME FACULTIES REQUIRED: Paramore admits that his Bloody Mary is pretty complex. "There's a lot of production with the 7452," he says. He starts with a glass rimmed with black lava salt, a nod to the coal in Park City's mining history. Next, he adds local High West Vodka 7000' and Bloody Mary mix. He tops the drink with a wasabi-celery espuma (Italian for "foam"), which is meant to mimic the snowy mountains nearby. He also mixes Worcestershire sauce and Tabasco together and squeezes it into a tiny pipette. He adds it to the mouth of the glass, opening down. If you want more bite, you squeeze the pipette. "This way, you're in control of how much spice is in your drink." WHY YOU SHOULD TRUST PARAMORE: "I'm no doctor." THE METHOD: Combine second set of ingredients to make the mix. Set aside. Rub a lime wedge around the rim of a glass. Dip the rim into black salt. Fill glass with ice and add 1 1/2 ounces vodka. Fill the remainder of the glass with Bloody Mary mix. Top with wasabi-celery espuma and a few dashes of cayenne pepper. THE METHOD: Combine ingredients in a blender. Mix until frothy. Strain. 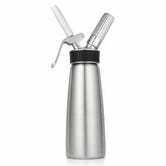 Put into a whipped cream dispenser. Add foam until Bloody Mary glass is full. Alyson Sheppard is a writer and editor based in Brooklyn. Her work has appeared in Popular Mechanics, Mental Floss, McSweeney's, National Geographic Adventure, the Boston Globe and more. Follow her on Twitter @amshep.